First published in 1977, this book is a companion volume to Suffer and Be Still. 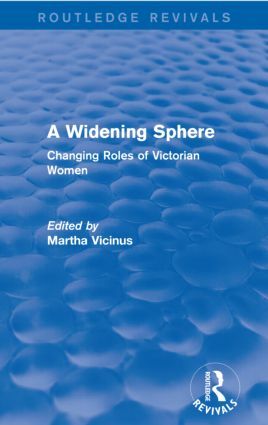 It looks at the widening sphere of women’s activities in the Victorian age and testifies to the dual nature of the legal and social constraints of the period: on the one hand, the ideal of the perfect lady and the restrictive laws governing marriage and property posed limits to women’s independence; on the other hand, some Victorian women chose to live lives of great variety and complexity. By uncovering new data and reinterpreting old, the contributors in this volume debunk some of the myths surrounding the Victorian woman and alter stereotypes on which many of today’s social customs are based.